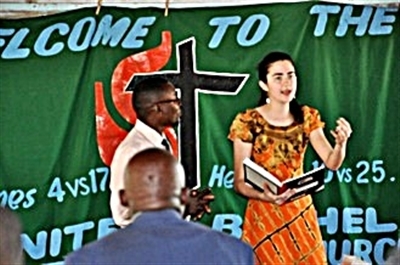 Susan Imes of First UMC, Ocala, ministers to people in Zambia, Africa, through her work with the New Life Center, operated by missionaries Delbert and Sandy Groves. In summer 2013, I came to Zambia with a group from First UMC, Ocala, my home church. I didn’t know what to expect; all I knew was that I had some sort of calling to Africa, so I was going to go. In the two weeks we were there, I encountered God in a way that made the summer I’d just spent as a church camp counselor look like a trip to Walmart. I came back to Zambia this summer because Sandy (Groves) had mentioned that sometimes young adults come spend a few months with them...and that I was welcome to do that. I don’t know how serious she was; I do know that, deep down, I knew then and there what I’d be doing this summer. In Kitwe, I had the chance to do some teaching. In the mornings, there’s “tutoring” for students who aren’t in school and didn’t pass their ninth-grade exam (most students fail the exam their first time taking it). While I don’t know how effective I was with the reading, I was really surprised at how much I liked teaching math. It could be slow at times, and frustrating, and my students ranged from kids who couldn’t really add to those who had started fractions...but it’s an amazing thing to see them improve, and get excited when they do. 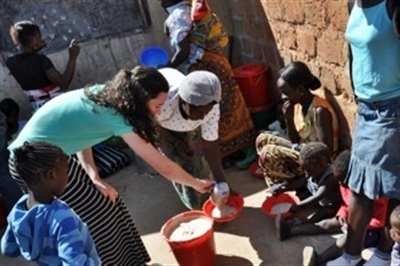 To read more about Susan Imes' experience at the New Life Center in Zambia, click here. April 1 in Florida. To learn more about their ministry, visit www.NewLifeZambia.com. To arrange a presentation at your church, email Groves@NewLifeZambia.com or call (727) 546-7763 or (407) 257-6604.